Yes, Jack does actually die. 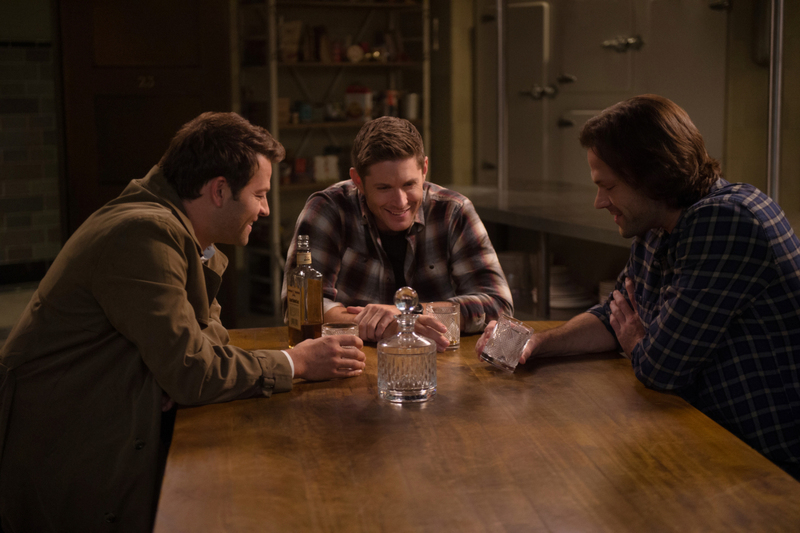 But that's right at the beginning of the episode, so we know already that team free will is going to do something about it after giving themselves one night of drinking and reminiscing just in case. Sam calls up Lily Sunder from many moons ago who I barely remembered at all. But she did some kind of special angel magic to keep herself from dying so she could hunt down angels because they killed her daughter or something. ANYway, Sam has called her up because he thinks maybe she can read some of Kevin's angel tablet scribblings. She can't. But she has an idea that they can use the magic she was using to basically use part of Jack's soul to keep him alive. Oh also she's old now instead of young because she's stopped using the magic. Just a minor detail. 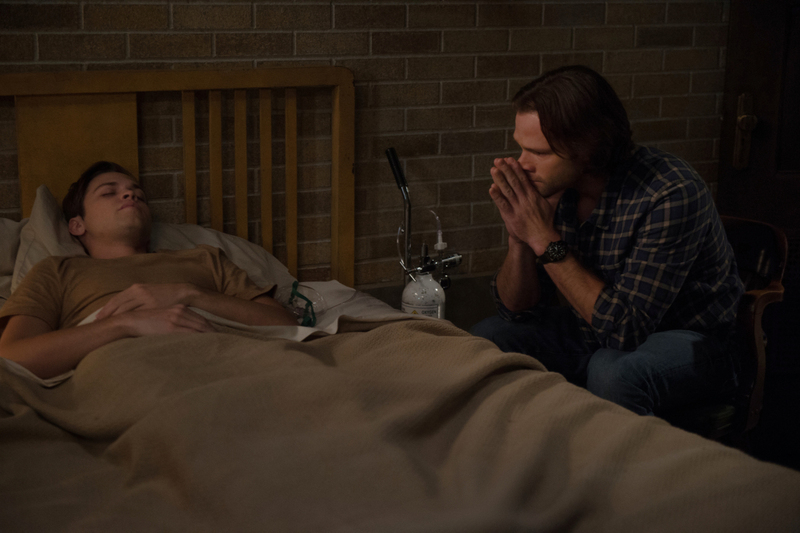 In order for this whole thing to work, though, Castiel has to go find Jack up in heaven so they can merge his soul with his body. Got all that? Now, Lily isn't willing to do all of this for free. She has one condition - that they make sure she gets into heaven when she dies, as she's pretty sure she's going to hell. 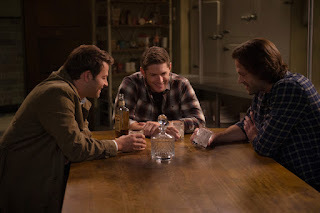 To find out her fate, Sam and Dean have to call upon Anubis who apparently is some kind of soul-weigher for heaven. And he confirms her worst fears - she'll be going to hell. Thus, she no longer wants to help them out, but they appeal to her motherly side, asking that she not let them go through what she went through in losing a child. Just to wrap up this side of things - she agrees, dies in the process of helping them, and ends up being able to get into heaven in the end after all because she did such a good deed. Okay, now let's get to Jack. He gets himself into heaven, but soon figures out that's where he is and goes in search of his mom. He seems to find her pretty easily, and they have a nice reunion, though it doesn't last very long. That's, of course, 'cause Cas has come to find him. Only he's found something else too - apparently, the big empty that was a thing back in season 13 is now after Jack because it believes that because he's not entirely human, he belongs in the empty rather than heaven. So, it's basically storming heaven to find him. It uses Castiel as a way to get to Jack by taking on the form of another angel, blah blah. Basically, Castiel ends up making a deal with the empty - take him in Jack's place. The empty agrees to this deal, but decides not to take Castiel right away, but rather wait and take him right at the moment where he feels happiest. Oh and as a thank you for inadvertently helping them out, the angels decide to tell Castiel where they think Michael may be. 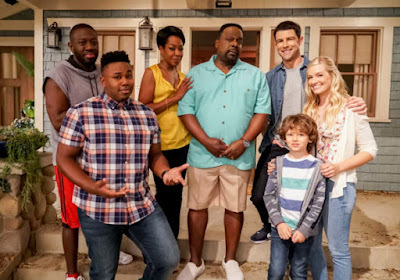 So, yes, Jack is back in his body, though with a little less of his soul, and the gang now knows where Michael probably is. Next up, they need to find the spear that can kill him. You know, simple. - I totally thought this was the last episode before the winter hiatus, but I was wrong. Sigh. Honestly I was ready for a break but oh well. - Lots of callbacks to some esoteric stuff in this episode with Lily Sunder and the whole empty business. I guess they're trying to tie up some loose ends? Sam: So what do we do? Dean: Say goodbye. Tomorrow. Tonight, we get loaded. Lily: You can do that? You can summon a god? Dean: We've done it before. Dean: I don't like rolling the dice on the word of a psycho ex-angel killer. I have yet to watch this episode and I may not since I just read your review. I'm happy that Jack isn't dead because I like his character. And I'm glad that they resolved his illness although I'm not sure about why he had to be ill to begin with. I guess I was thinking that Michael, who I think is hiding inside of Dean, might fix him or something and that's how it would be revealed that he is inside of Dean. Ha ha ha!! I'm kind of tired of deals, to be honest, after so many years of them. Maybe Cas will go to the empty and defeat EmptyRedEyedLucifer? Thanks for your review. I hope that the last show before the hiatus is a doozy that captures your imagination! I had been thinking it would be the one where we find out Dean is still Michael. But who knows? Jensen had said before this season started that Michael would be around inside of Dean for longer than the fans would like. So I'm thinking he's in there still. I just don't want Lucifer to get inside of Sam for some sort of rehash of the end of season 5! Yeah I like Jack too, so I'm glad he isn't dead. And I agree that the whole Michael/Dean of it all doesn't seem over yet, for sure!